"He was trash but now he is eternal, like the stars in the sky...Ah my partner!" For thousands of years, man has gazed at the stars and wondered what they are. He made up stories and legends about them. And one of those stories was that stars were souls or spirits, watching down upon the Earth. This probably has its origins in modern stories in two sources. The first is Greek Mythology, in which many of the constellations were heroes placed there by the gods for their heroic deeds. The second is Plato's Cosmology, which asserted that every soul has a companion star that it returns to upon death, so long as it lived a just life. This is Older Than Feudalism. This trope exists because of the logic of its Super Trope, Heaven Above, where anything skyward is associated with everything divine. Related to Ascend to a Higher Plane of Existence and Died Happily Ever After. The final scene of Sailor Moon has Usagi placing her hand over her heart and saying a star was just born (her daughter conceived). The '90s Sailor Moon anime has an episode where a dreamy astronomy teacher references this trope during a show in which he and Taiki are participating. He believes that people become stars when they die. Taiki gets annoyed and says that stars can only be made by living people. Particularly interesting because in Sailor Moon a senshi's Starseed is her essence — this is what Taiki is referencing in this case. But a senshi can be reborn after death as long as her Starseed intact, so it's the same thing as a soul. Darker Than Black inverts this. Each star in the Alien Sky above Earth represents a living Contractor, which falls out of the sky when the Contractor dies. Inverted in Cowboy Bebop. Everyone has a representative star, and it goes out when they die. In Yu-Gi-Oh! 5D's, Greiger seems to become a falling star when he disappears. Ai (Amber) from Pokémon: The First Movie believes this is what will happen to her during her post-death monologue in The Birth Of Mewtwo radio drama. Dr Fuji: Ai! Come back! Ai: Sorry, Papa. I can't go back. Dr Fuji: No, I want to get you back! I don't want to be by myself! Ai: It can't be helped. I'm probably going to become a star. In one issue of Man-Thing, Korrek recounts a story where a man ventured into the sky to pick a star to gift his lover. The stars are made of the souls of warriors, so upon bringing the thing down, it turns into one, kills the man and steals his woman. had the event Last Hero Standing where Loki made a last ditch attempt to destroy all the heroes. He was thwarted, but not without heavy casualties, Captain America among them. Allfather Thor honored him by transforming his body into a star whose corona resembles his shield, visible from Earth to all as an enduring symbol of hope. In My Little Pony: Friendship Is Magic fanfic "The Circle of Friends," Twilight Sparkle's five deceased friends form a circle of five stars in the night sky, with a little empty space for one more star. , extricated in the sequel "Homelands", the shamanistic zebras regard the stars as particularly dangerous spirits, whom only the most insane and/or evil shamans dare to deal with. There's an entire tribe of star worshippers, Starkatteri, shunned and distrusted by the rest, who once tried to to use the star-granted power to Take Over the World and ended up nearly destroying it. This trope is referenced in The Hunger Games fanfiction Some Semblance of Meaning, when Vale is stargazing and comments about how stars last forever, and Obsidian tells her that they fade and die like people do. She then tells him that, like people, they might go out eventually, but while they live, they're all given an opportunity to shine, and once they die, more stars are born to take their place, so the sky is never dark. In the Pony POV Series, the Celestial Bodies of the Alicorn Elders (the Father of All Alicorns and Fauna Luster) have stars that are this trope. In the case of the Father, he's Heaven and the stars are the souls of the righteous dead inhabiting him. In the case of Fauna Luster, she's the birthplace of souls and the stars are souls preparing to depart for life (thus why she has the form of a nebula). In The Lion King, Simba says he was taught that the stars are the spirits of the old kings, which gets a confirmation when he later gets a starry vision of his father. Timon, on the other hand, claims that stars are fireflies that got stuck in the sky. That also was confirmed... by The Princess and the Frog. Amusingly, Pumba proposes the scientifically correct theory ("balls of gas burning billions of miles away") and is brushed off. When Simba told them what he thinks, they laugh at such an idea. In The Princess and the Frog, when Ray dies, he becomes a star like Evangeline. In Dragonheart, Good Dragons who die become a star in the Draco constellation. This happens to Draco when he dies. Draco: "To the stars Bowen. To the stars." Done at the end of Hercules (1983) film. In Stardust, when Tristan is old (Yvaine remains eternally youthful), they use the Babylon Candle to return to Yvaine's home, and Tristan becomes a star along with her. 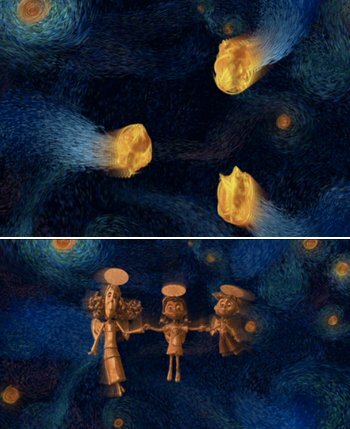 At the beginning of the movie It's a Wonderful Life, some angels are talking and the visuals shown are a galaxy and a nebula that flash in synch with their voices. Then Clarence is summoned and a smaller star shoots into view. Clarence is also explained to have died previously, although it's not mentioned whether the other two angels were ever people. In "A Song of Ice and Fire", the Dothraki believe that the stars of the spirits of the valiant dead, riding flaming horses across the sky. In one Percy Jackson and the Olympians novel, the goddess Artemis's Lancer Zoe Nightshade is killed. She is honored with a whole constellation called "the hunt". Zoe actually knew she was going to get killed before going on the mission, but went on it anyway to save her beloved Goddess. This explanation is given in Redwall. In Warrior Cats, when a Clan cat dies they go to StarClan. (Except the evil ones, who instead go to the Dark Forest.) The Tribe of Rushing Water, which shares a common ancestry with the clans, calls it The Tribe of Endless Hunting. In the Old Kingdom trilogy, it is eventually revealed that this is the nature of the Ninth Gate. In The Darkangel Trilogy, this is believed to happen to everyone when they die; when the protagonist frees the darkangel's victims/wives from undeath, they form a new constellation with a gap in it, and she figures they've reserved a space for her, when it's her time. Eärendil wasn't killed in The Lord of the Rings mythos, but he became a star anyway. This is because the Silmaril on his ship that he uses to sail in the void among the stars is seen as one. ...You mean the Silmaril on his space ship? Inverted in The Little Match Girl where falling stars represent someone dying. Dragonlance: Stars over Krynn are portals to the plane of Radiance. But each new one is created upon a Heroic Sacrifice — inhabitants of the world being aware of this fact, and supposedly rejoicing. Inverted somewhat in A Wrinkle in Time, where Mrs Whatsit is revealed to be something akin to the ghost of a star that exploded, sacrificing itself to fight the Black Thing. The stone-age people of West of Eden believe the stars to be "tharms" (souls) of dead warriors. The Clan of the Cave Bear contains a scene where Creb tells Ayla and Uba that stars are the hearth fires of those who have died and passed on to the world of the spirits. He also says the Clan's totem spirits have their own "fires" and points out the "fires" of the Cave Bear and the Cave Lion. A Hungarian epic poem by Sándor Petőfi, called János vitéz, has a scene where the eponymous János is travelling in the mountains with his comrades in the army at night and they are so high up they can literally reach the stars. János muses to himself, "They say each star is the soul of someone living..." then goes on to say that the Wicked Stepmother of his Love Interest should count her blessings János has no way of knowing which star is whose because if he did he would knock it off of the sky, killing her. Inverted in Narnia, where every star is a divine being that must live out a lifetime as a mortal when it goes out. In The Voyage of the Dawn Treader, the heroes encounter two stars: one who has been banished from the heavens for an undisclosed reason and now lives as a mortal magician, and one who lives with his daughter on an island near the edge of the world and is brought a fire berry by a flock of birds every morning to replenish his energy before returning to the sky. Subverted Trope in The Divine Comedy; upon ascending into Heaven, it seems as if every human soul ascends to a different Heavenly body, whether it be a star or one of the planets. Our hero finds it odd that somehow the pagan philosophers were right about this, but God's messenger, Beatrice, explains that the souls only appear on different stars and planets to help our hero understand the distinctions between types of saints. Baldrick seems to believe this when George dies in Blackadder the Third. He also believes in a giant pink pixie in the sky. Baldrick: "There's a new star in the heavens tonight. Another freckle on the nose of the giant pixie." Rammstein's "Engel" (Angel) is about this. we are afraid and alone. "Shooting Star" by Bob Dylan from his album Oh Mercy. I always kind of wondered if you ever made it through? Jaws jumps out, and Quint gets bit! Right in half, like a kit-kat bar! That's Quint. Up in heaven. He's a star now. Greek Mythology is rife with this. Orion was made into a constellation after being killed by Apollo's scorpion (also a constellation). Perseus and Hercules each got one constellation commemorating their exploits. Leo is the Nemean Lion. Cancer is Karkinous, the crab Hera sent to attack Hercules while he was battling the Lernean Hydra. Canis Major and Minor are a hound and vixen- the hound was fated to always catch his prey, the vixen, to never be caught. Turning them into constellations was the only way out of the Logic Bomb. Aquarius is Ganymede, Zeus'... cupbearer, among other things. Hera was so not amused by Zeus giving him the job (which was filled by their daughter Hebe beforehand) that Zeus had to turn Ganymede into a constellation to keep him safe. Depending on the myth, the constellation Auriga is made up of charioteers placed there by the gods in thanks for the invention of the chariot. Bootes is either the inventor of the wagon placed there in thanks, or Icarus who was murdered when his wine was mistaken for poison and placed there by Dionysus. Centaurus (or Sagittarius depending on the version) is Chiron, the wisest of the centaurs who surrendered his immortality after being pricked with a poison arrow. Corvis is Coronis, a lover of Apollo's. When she was unfaithful to him, his twin sister Artemis killed her and Apollo placed her among the stars. Andromeda and her mother Cassiopeia were put in the sky as constellations for bad-mouthing the gods. How becoming a constellation can be a used as a reward and a punishment isn't clear — maybe it depends if the gods draw a flattering picture? Although Cassiopeia was supposed to be sitting in a topsy-turvy throne, hanging upside down forever. Ursa Major and Minor were supposed to be one of Zeus' mistresses and her child (supposedly Hera ensured the two never dipped below the horizon because she carried a grudge). Another version of Ursa Major and Minor has the mistress being turned into a bear not by Hera, but by Artemis, as said mistress was her hunter raped by Zeus. In both versions, the child was turned into a bear(cub) when he happened upon his mother (in bear form), in a desperate bid by Zeus to prevent from the mother bear from killing him. It worked. The Pliades, who were turned into stars by Zeus to confront Orion, their father (who is also a constellation.) There's also a myth that they were saddened by their father's fate or their siblings' fate, and Zeus turned them into stars. Gemini, the twins, are Castor and Pollux, (half)twin brothers of Helen of Troy and Clytaimnestra. One was mortal, the other was not. When the mortal one died, his brother either got so depressed that Zeus took pity on them and made sure they were never separated again, or marched down to the Underworld, found his brother there, and refused to leave until Zeus made sure they were never separated again. The stars Vega and Altair are said to be a pair of lovers separated by a great river (the milky way) in many eastern legends. There's a festival when they meet once a year in China, Korea, Japan, Vietnam, and possibly other places. Heaven is sometimes depicted this way. At least one indigenous tribe in North America also believed people became stars when they died. Dungeons & Dragons 4E cast a negative light over this trope: each star in the sky is an aspect of an Eldritch Abomination outside the world, peering into reality. The Warlock class (who are not nice people) gain power from those stars, and their magic spells have particularly Lovecraftian flavor. Would anyone want to be watched by those stars? In Exalted, beyond the usual constellation, gods and mortals alike has their own star which represent their Destiny. When someone dies, their star flickers out. One can affect someone's Destiny by affecting their star, though this is a privilege belonging to the members of Bureau of Destiny (e.g. Sidereals). Alluded to in the song "One More Angel In Heaven" from Andrew Lloyd Webber's Joseph and the Amazing Technicolor Dreamcoat, when Joseph's brothers inform Jacob about Joseph's "death"; "There's one more angel in Heaven, there's one more star in the sky..."
In Yoshi's Island, when you defeat Raphael Raven, he becomes a constellation. Maxim and his comrade/wife, Selan, kick the bucket at the conclusion of Lufia II: Rise of the Sinistrals. This was fated to happen, as Maxim's sacrifice has become legendary in the era the previous game took place in. However, the epilogue expands on the events foretold, with Maxim soldiering on even after his party has frittered away and Selan has been killed. He dies from exhaustion after completing his mission, whereupon he sees Selan's spirit and turns into a star. The pair of them float across the world map and take one last look at their infant son, who seems to sense their presence. In Kingdom Hearts, the stars in the represent worlds as a whole and they disappear from the night sky when that particular world is submerged in darkness. Then, in Kingdom Hearts II, we have the Pride Lands as a world, which reaffirms the plot point from the movie that the old rulers of Pride Rock become stars in the sky upon death. This is also shown in Birth by Sleep, when, after Master Xehanort strikes down Master Eraqus in front of a horrified Terra, Yen Sid notes, "Eraqus's star has blinked out." The contradictions can just be chalked up to the worlds running on the Theory of Narrative Causality. Discussed in Phoenix Wright: Ace Attorney - Justice for All. A ringmaster uses this as an euphemism for death for his animal tamer daughter. (In the Japanese version, the ringmaster says the dead are sleeping.) Problem is, the daughter truly believes in this, and in a roundabout way, leads to a murder. A common interpretation of the bad ending of Sonic the Hedgehog 2 (8-bit) is that Eggman kills Tails, because Sonic looks up and sees Tails as a constellation. In The Revenge of Shinobi, if you take too long defeating the Final Boss, your girlfriend gets crushed, and you see her in the sky instead of at your side in the ending cutscene. BIONICLE: Spirit Stars appear before a Toa is created or when a Toa completes a certain task. In the Courage the Cowardly Dog episode "Last of the Star Makers", the mother Star Maker (a giant space squid) dies and turns into a huge carpet of stars. In the My Little Pony: Friendship Is Magic episode "Apple Family Reunion", Applejack's absent parents (established to be dead by Word of God) are represented by a pair of shooting stars. Carl Sagan once pointed out, from a physics perspective, that ""The nitrogen in our DNA, the calcium in our teeth, the iron in our blood, the carbon in our apple pies were made in the interiors of collapsing stars. We are made of starstuff." In other words, stars aren't made of dead people, people are made of dead stars.